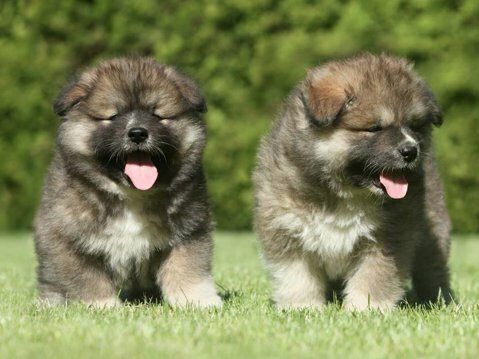 The official breed name is Caucasian Ovcharka, commonly known as the Caucasian Shepard Dog. 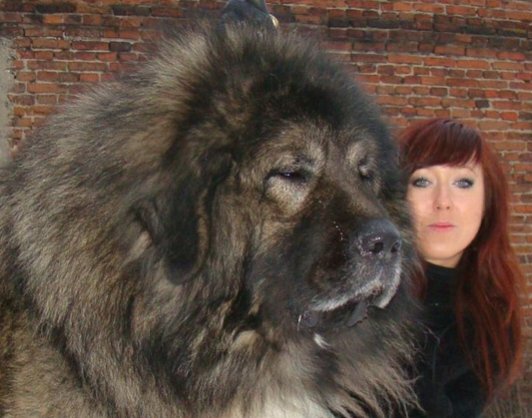 Originating from the Caucasus Mountains in Russia, these sizable dogs are members of the Molosser breed and historically have been used for centuries to protect properties, guard livestock — and yes, hunt bears! However the term “used to hunt bears” is somewhat misleading, as they are more capable of herding the bear instead of attacking or fighting it. Since they’re size is intimidating, the bear sees them as a threat and will back down allowing for the accompanying humans to be protected. The Caucasian has an elaborate history that goes well beyond its pastoral origins. Realizing the versatility of the breed, the Soviet Army enlisted the Caucasian as a service dog, and it was used as a security guard during both war and peace times. Breeding and promotion of the breed for military and industrial use became the responsibility of the famed "Red Star Kennels" where many modern dogs had their origin. 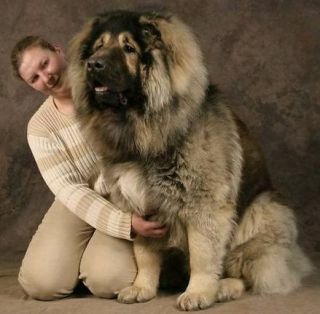 The Caucasian Ovcharka — who looks like a bear itself — is a powerful, athletic dog, strongly muscular, and heavily boned in proportion to height. Weighing over 200lbs and standing 6 feet or taller, the head is larger than you'll find on any other dog - where it is wedge-shaped, tapering slightly to a blunt muzzle with high-set of hanging ears (which may be cropped), and deep-set, oval-shaped eyes. The thick tail hangs down to the hock but may be carried above the back as a sickle-shaped hook or ring when the dog is excited or moving. Three coat lengths are accepted, all double-coated and thick. Coat colors include shades of gray, fawn, and reddish, with white markings and often a dark facial mask. Having emigrated to the United States a while back, many breeders warn that they are not an easy dog to maintain in urban or suburban households. Since they have a natural guardian instinct, they are better suited for rural environs where they can ward off wolves or coyotes from menacing crops and livestock. Should you be interested in acquiring a Caucasian Ovcharka, the American Kennel Club is a good place to start. Contact information is available for a majority of breeds, but the AKC does not recommend one club over another - and pricing can range from $1000USD on up. It's perhaps a sign of the times that the breed is now becoming more popular domestically to protect property from thieves and in prisons to deter the inmates. Some breeders suggest that this canine should not be considered for first-time owners. It’s more for experienced dog owners who can dedicate a lot of quality time to train and socialize this majestic creature. Like their masters, these dogs are happiest when they have a jobs to carry out. Their instincts are such where they are naturally born to guard and protect. If you are the type of master who has an abundance of patience and can invest the time and energy into training, you can expect unfaltering loyalty and total devotion from your Caucasian Shepherd Dog. If not, you may be challenged by having a very aggressive oversized pooch who lacks the social skills to be nice to your neighbors, visitors or even fellow family members. SEE: More of the Latest Animal News here.